On Saturday 23rd February, the Bruintjieshoogte Marathon was run, for the 36th time, in perfect conditions, and was very well supported. Visitors were full of praise for the beautiful route, and the great organisation. Well done to the local Athletics Club, and the sponsors. 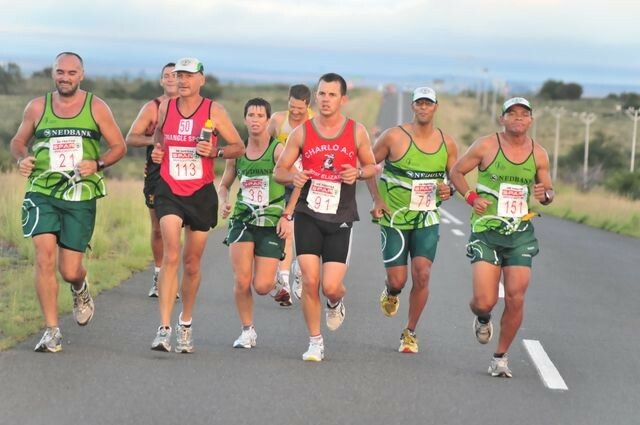 This race run between Pearston and somerset East, over the dreaded Bruintjieshoogte, is a qualifier for the Comrades marathon later in the year. Local girl, Bernadette Swart, who has run the Bruintjies many times, came home strongly, and is planning to run her first Comrades this year. Young runners, who had finished their races, from local schools, showed great interest in the Tourism information stand set up by the Blue Crane Tourism office. This promises well for the Tourism Education programme Blue Crane Tourism will be taking to the schools later this year. The Boschberg Hub has a very full programme for running and mountain biking events in the pipeline for 2013. Local sports clubs have come on board to help organise these events, and utilise the new Events Centre and the trails on the Boschberg. An event involving running and cycling is planned to take place on 12th May, and the first Boschberg Mountain Bike Festival on 22nd and 23rd June. The Boschberg Classic MTB will be held in early December again, with an off road Triathlon planned for the same weekend.